65 Feet of Climbing, Weaving, Jumping and Sliding Mayhem just for your event. 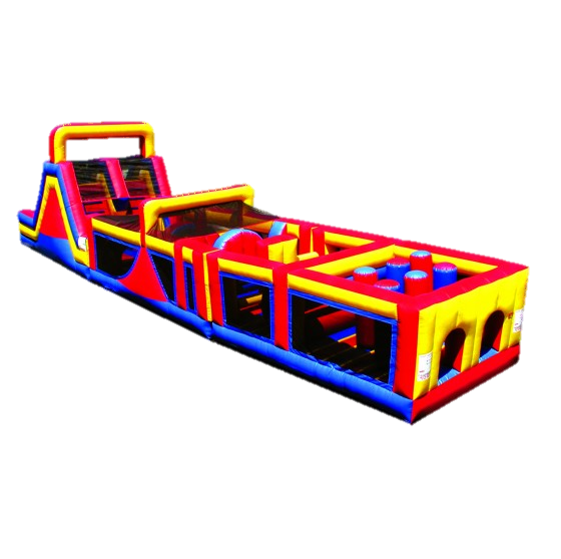 Are you, your coworkers, family and friends ready to take on this Obstacle Course? Come tackle the challenge and find out. The perfect item for a birthday party, school, church event or a company picnic. Having a large event? Need additional Tables, Chairs, or Canopies let us know how we can help you and your event be a success. Do you Dare to Accept the Mega long 65 Foot Obstacle Xtreme Challenge? Compete against each other on our 65' long obstacle course which includes a 16' high dual lane high slide. Who is faster, him or her? Or are YOU?